Settings: Printed on a MakerBot Replicator 2 with .3mm layer height and no raft or supports, in 31 minutes. First of all, the snaps on the old models were not "ambidextrous"; some snaps had more tines than others, and we had to think carefully to make sure that we put the correct type of snaps on each face. In our new models every snap on every side is identical, and due to the orientability of the polyhedra these snaps automatically align together nicely. Second, and by far the most importantly, the old hinge/snap models were made in Tinkercad while the new models were made in OpenSCAD. The reason this is important is that the OpenSCAD models are parametric; in the OpenSCAD code we can change the length, thickness, and tolerances simply by changing the appropriate numerical parameter and then re-compiling. In Tinkercad, changing tolerances meant re-doing each hinge and snap by hand. Even better, since these new models are designed in OpenSCAD we can upload them to the Thingiverse Customizer so that users can change parameters as they like without ever having to deal with the actual code. Third, because of the way the OpenSCAD code for these models was written we will be able to use the code to create more exotic polyhedra than the Platonic solids, without too much extra work. 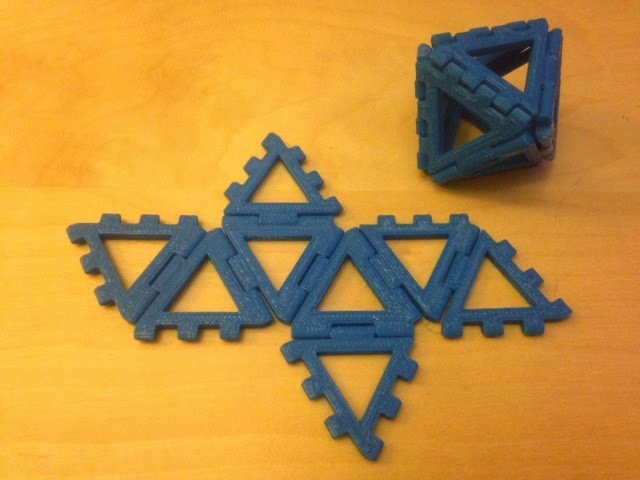 For example we could construct nets for all of the semi-regular polyhedra, with different types of faces within the same model. Fourth, because we stole some design code from our Print-in-Place Fidget Cube, these new models have much more reliable hinges with fewer non-manifold edges and fewer printing problems. The new hinges can also be printed smaller than the previous models' hinges. The fifth reason is kind of weird, which is that the snaps and hinges on this model don't look similar. We constructed the old models so that the snaps and hinges looked as much like each other as possible, so that the folded-up object would look as regular and homogeneous as possible. But it turns out to be kind of difficult to unfold an assembled object if you can't easily tell which edges have the hinges and which have the snaps! For the new nets we purposely made the snaps and hinges easy to tell apart.